This painting titled General View of the Union Lines on the Morning of July 3, 10 AM, During the Attack of Johnston’s Div. C.S.A. by the artist Edwin Forbes shows the area around the Baltimore Pike. 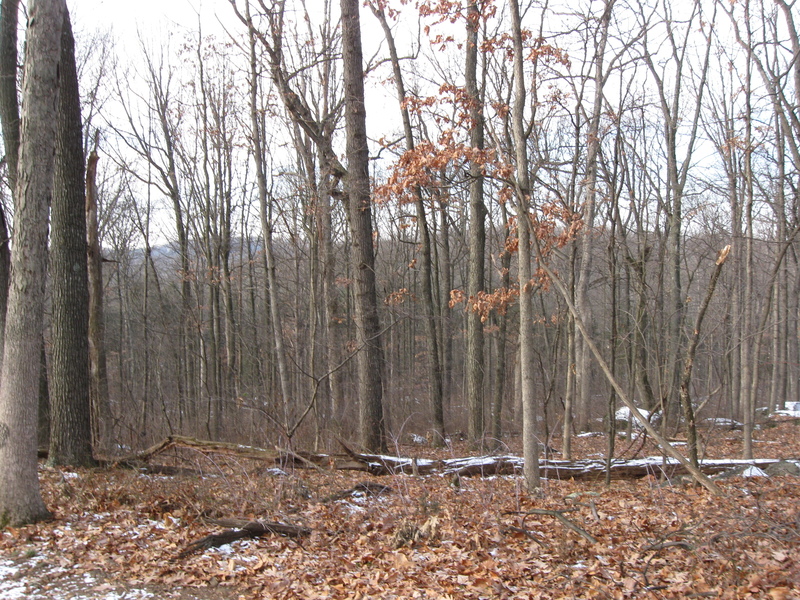 Powers Hill is on the far left with a lot of its trees removed, near the summit. Trees are still present to the left of the summit, however. Granite School House Road is at the bottom of Powers Hill with some ambulances and marching soldiers. 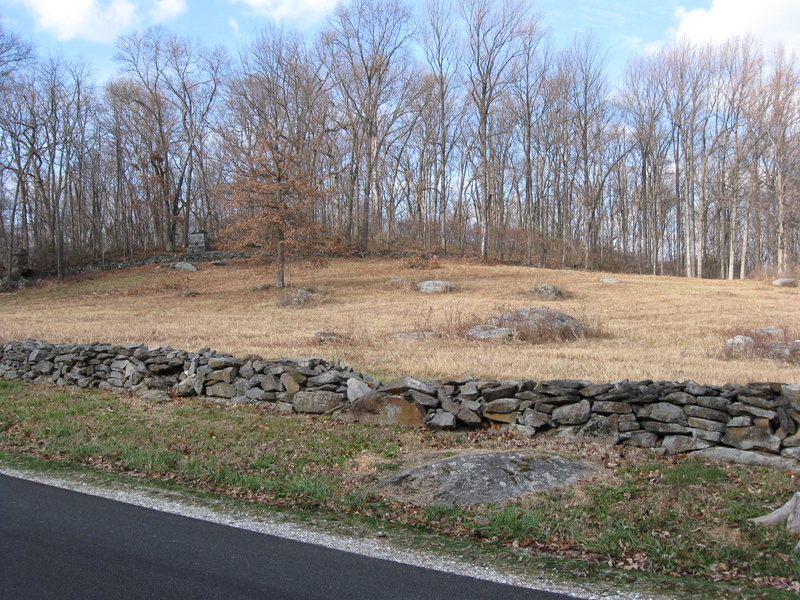 Blacksmith Shop Road Runs from the bottom right of the picture to the left (containing men on horseback and some marching soldiers) where it forms a junction with Granite School House Road and eventually the Baltimore Pike. The Baltimore Pike is shown running over Cemetery Hill in the Center background. Culp’s Hill is mostly hidden by battle smoke in the right background. McAllister’s Hill/Wolf’s Hill would be the hill on the far right. This view, courtesy of the Library of Congress, was painted between 1865 and 1895 from a drawing facing northeast at approximately 10:00 AM on Friday, July 3, 1863. This drawing by the artist Edwin Forbes is the basis for the painting shown above. The drawing shows the area around the Baltimore Pike. 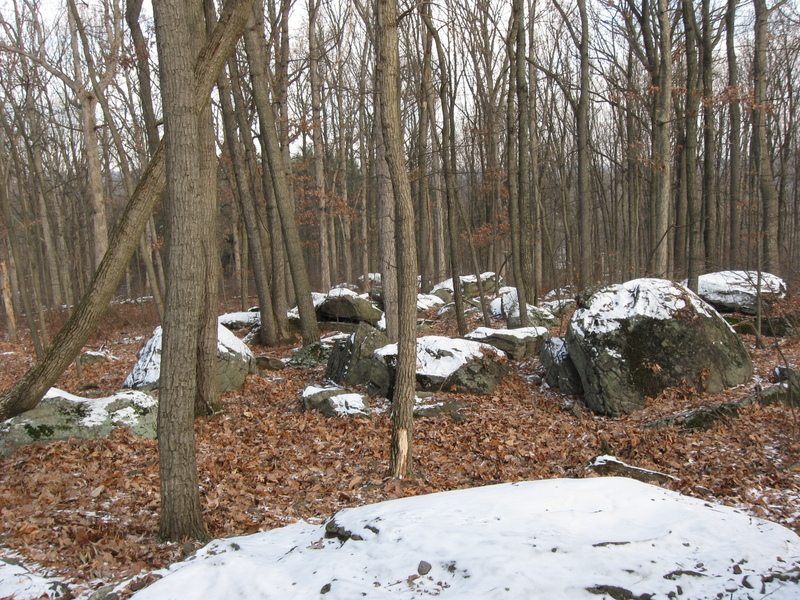 Powers Hill is on the far left with a lot of its trees removed, near the summit and a couple of artillery pieces visible. Trees are still present to the left of the summit, however. Granite School House Road is at the bottom of Powers Hill with some ambulances and marching soldiers. 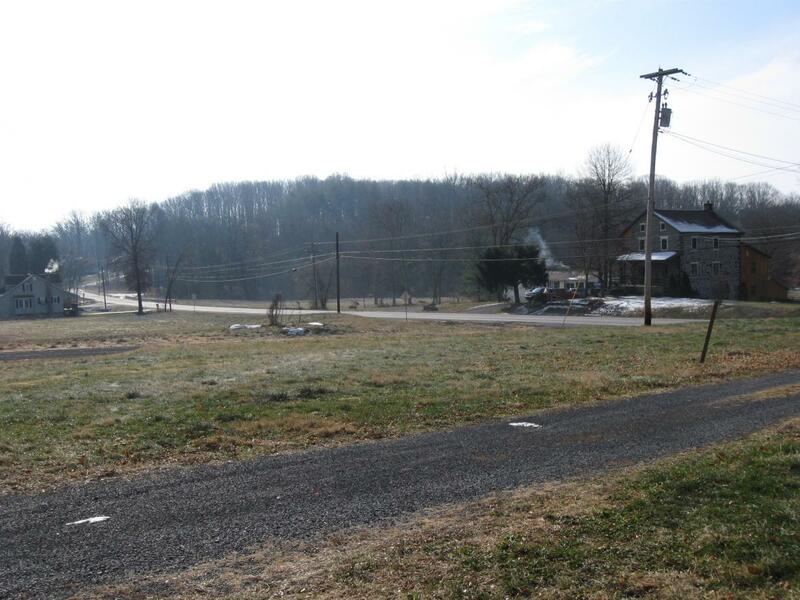 Blacksmith Shop Road Runs from the bottom right of the picture to the left (containing lots of marching soldiers) where it forms a junction with Granite School House Road and eventually the Baltimore Pike. The Baltimore Pike is shown running over Cemetery Hill in the Center background. The Cemetery Gatehouse is much farther to the left of the Baltimore Pike than it actually is. 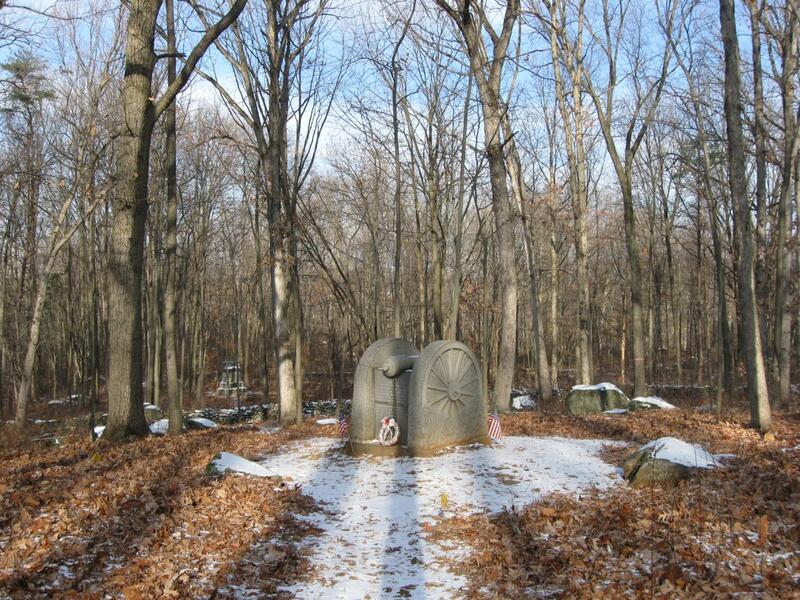 East Cemetery Hill is shown by the number “11.” Culp’s Hill is shown by the number “1.” The Lower Culp’s Hill/Spangler’s Meadow area is shown by the number “9.” McAllister’s Hill/Wolf’s Hill would be the hill on the far right. The drawing is certainly not to scale, but gives a good view of how busy this area was during the battle. This view, courtesy of the Library of Congress, was drawn facing northeast at approximately 10:00 AM on Friday, July 3, 1863. 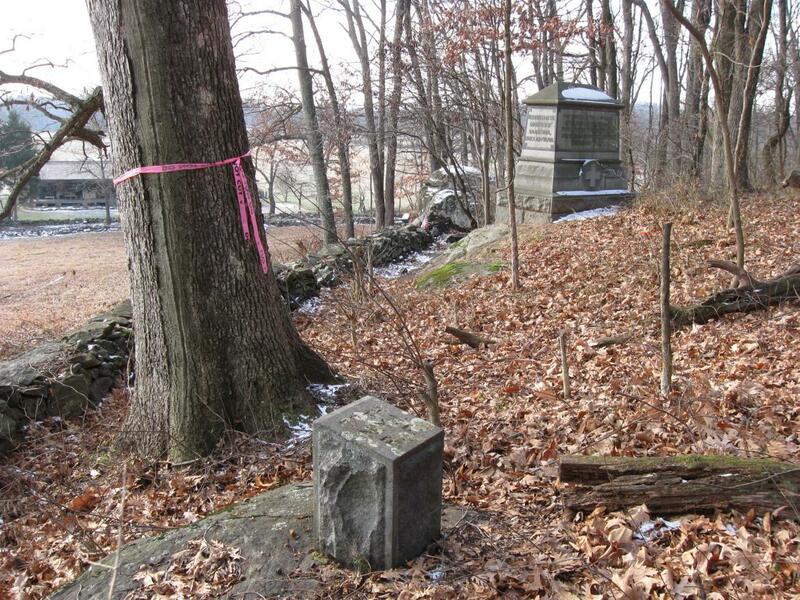 As part of the National Park Service’s efforts to return the Gettysburg Battlefield closer to its 1863 appearance, preparations have been made to remove trees from Powers Hill. 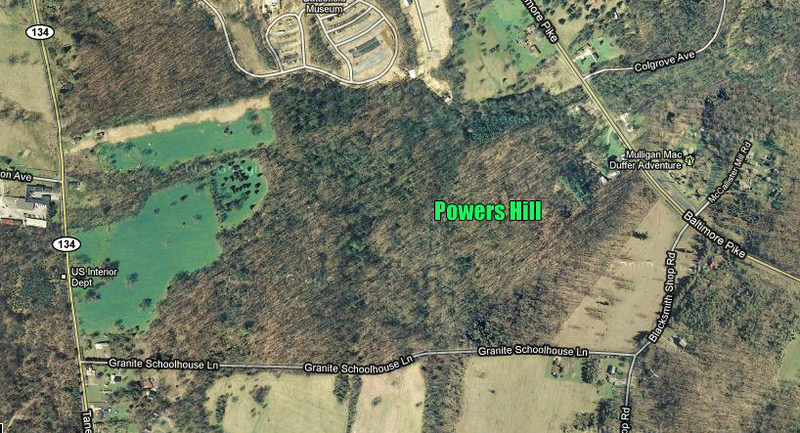 Powers Hill is located in an area between the Baltimore Pike, Blacksmith Shop Road, and Granite School House Lane. 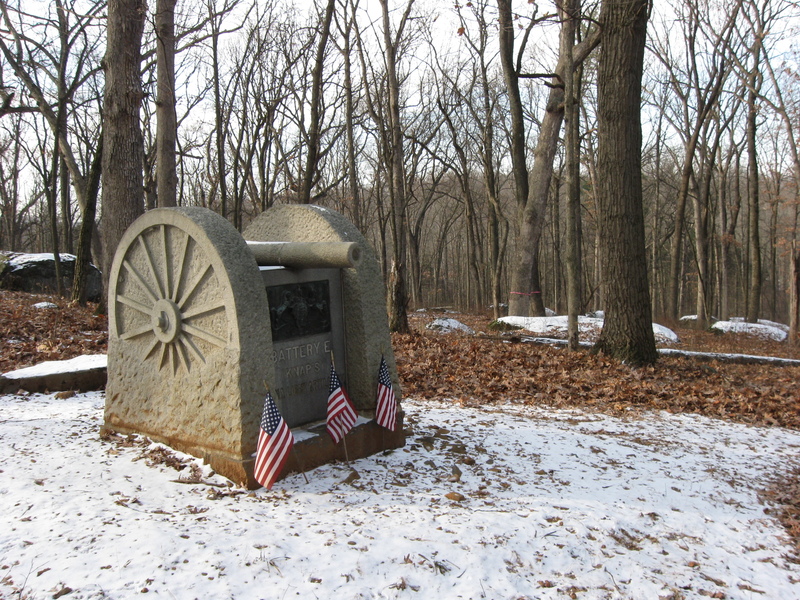 It was known during the battle as a Union artillery position, as a signal station location, as the headquarters of the Twelfth Corps commander Major General Henry Slocum, and as the temporary headquarters of Army of the Potomac commander Major General George Gordon Meade. 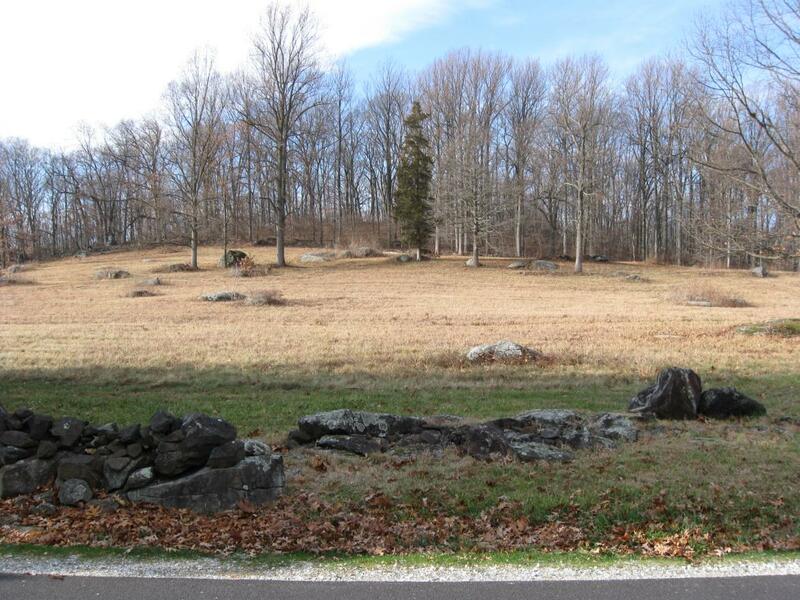 Meade moved his headquarters from the Leister House to Powers Hill during the bombardment preceding Pickett’s Charge. He returned to Cemetery Ridge after Pickett’s Charge had been repulsed. See our previous Powers Hill post on April 10, 2008. This map gives you an idea of the location of Powers Hill, and of the trees currently covering the Powers Hill area. This map was created facing north at approximately 11:30 AM on Sunday, December 19, 2010. 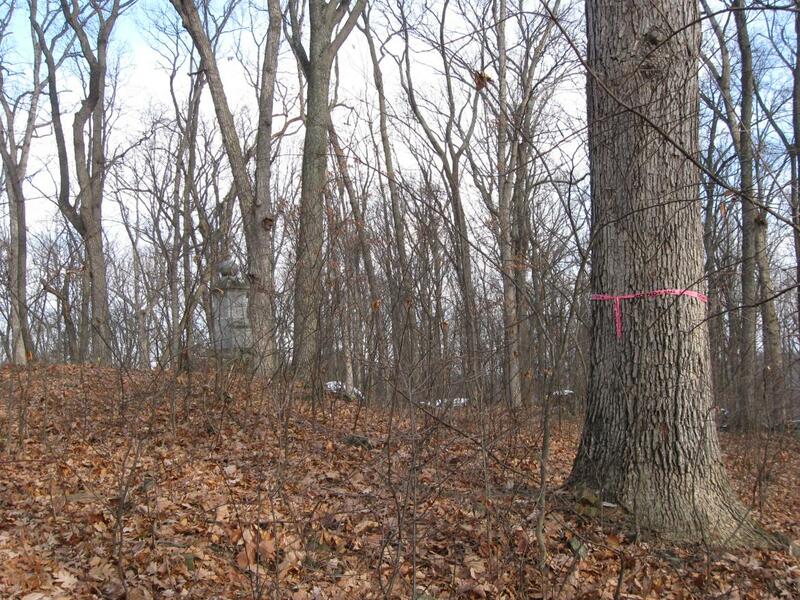 Powers Hill has been prepared to have its trees removed. We’ll start at the Granite School House Road, which runs from right to left. To the left and well out of sight, it connects to the Taneytown Road. To the right it connects to Blacksmith Shop Road and eventually the Baltimore Pike. This view was taken facing northwest at approximately 10:30 AM on Sunday, December 19, 2010. 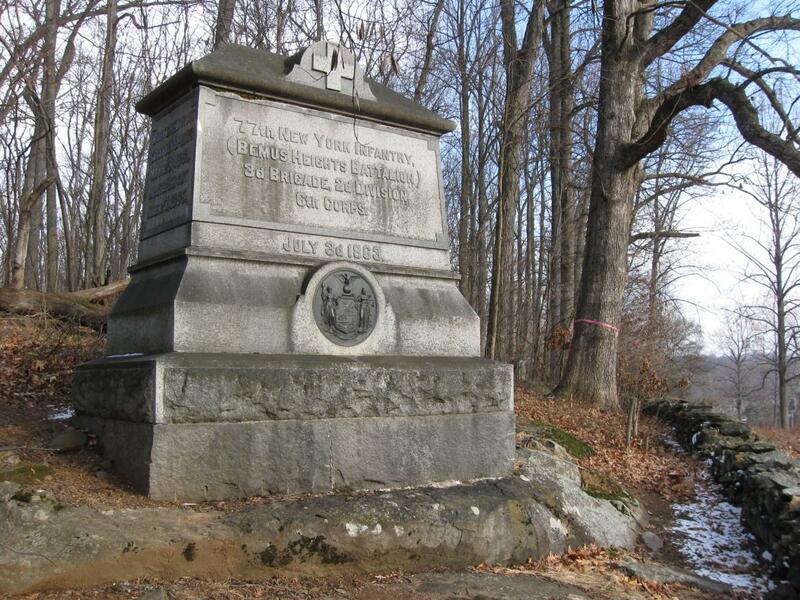 We’ll walk up the hill to the monument to the 77th New York Infantry Regiment. National Park Service spokesperson Katie Lawhon replied to our inquiry on when the Powers Hill tree cutting would begin with: “We don’t have a firm date yet, as it contingent on the weather, and the completion of work now underway along West Confederate Avenue.” This view was taken facing north at approximately 10:30 AM on Sunday, December 19, 2010. 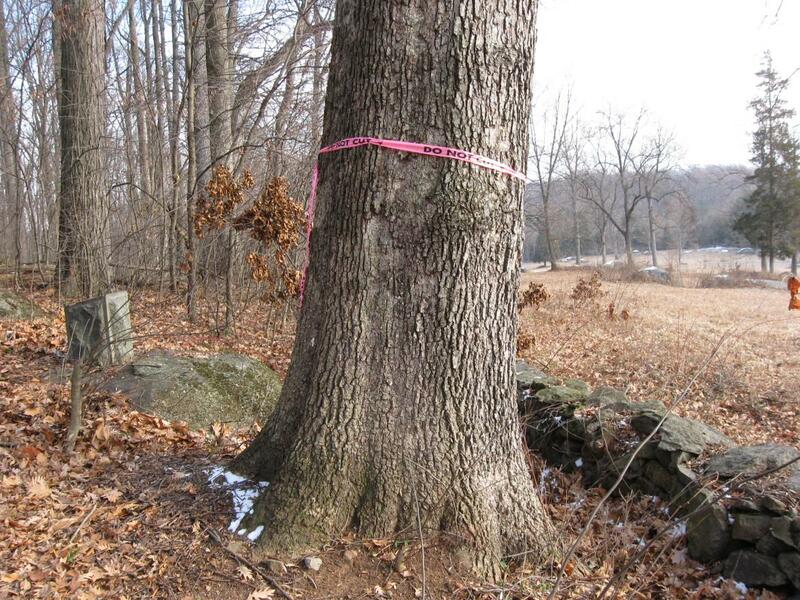 The trees that are not to be cut down have the pink ribbons around them, such as the tree in the right background. This view was taken facing northeast at approximately 10:30 AM on Sunday, December 19, 2010. The pink ribbons say “Do Not Cut,” but there aren’t many of them up here that have the ribbons around them. We only saw seven. We didn’t see all the trees on our walk, but we saw a lot of them. So let’s say that less than a dozen have the ribbons around them. This view was taken facing south at approximately 10:30 AM on Sunday, December 19, 2010. 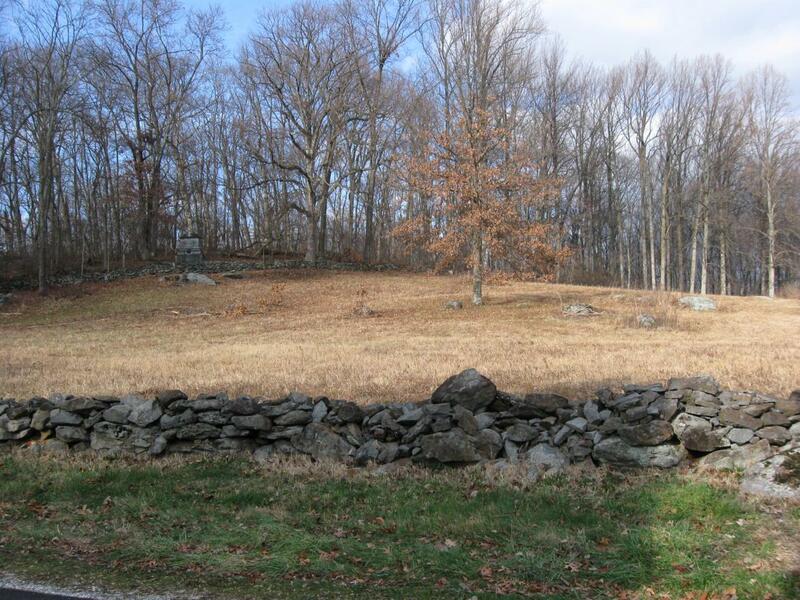 We hope that when the National Park Service contractors remove trees in this area they avoid damaging the stone walls. This has been a problem in previous tree cuttings. The monument to the 77th New York is in the right background. 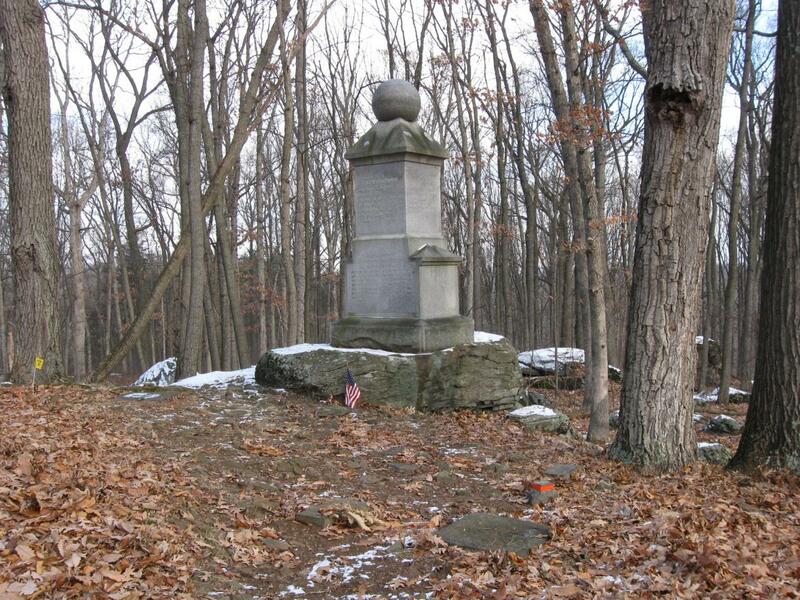 The right flank marker to the 77th New York is in the foreground. Grante School House Road is in the left background. This view was taken facing southwest at approximately 10:30 AM on Sunday, December 19, 2010. 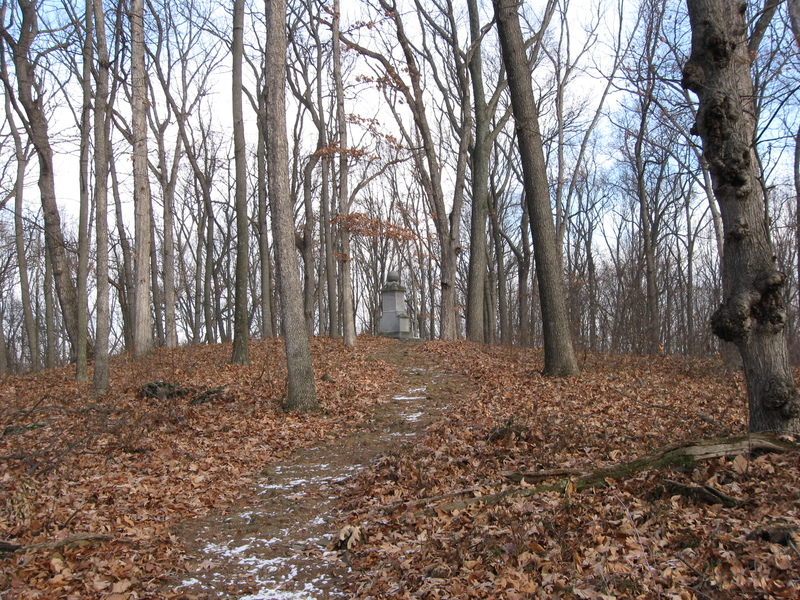 The Edwin Forbes drawing shows trees gone from the summit, where the monument to Rigby’s Battery A First Maryland Light Artillery is located, but that there were trees on this west/southwest side of the summit. This view was taken facing northeast at approximately 10:30 AM on Sunday, December 19, 2010. So certainly these trees won’t be removed, will they? The Edwin Forbes drawing shows the limbers and caissons for the artillery pieces on the top of Powers Hill, placed here in the trees on the southwest slope. This view was taken facing southwest at approximately 10:30 AM on Sunday, December 19, 2010. But we think they might because in this area there’s only one tree that has a “Do Not Cut” ribbon around it. The monument to Rigby’s Maryland Battery is in the left background. We hope that the National Park Service has good evidence that there weren’t any trees in this area. We hope that they aren’t just removing trees that don’t need to be removed in order to satisfy a contractor, or because it’s easier to remove them all than trying to figure out where the trees actually were or weren’t. This view was taken facing northeast at approximately 10:30 AM on Sunday, December 19, 2010. 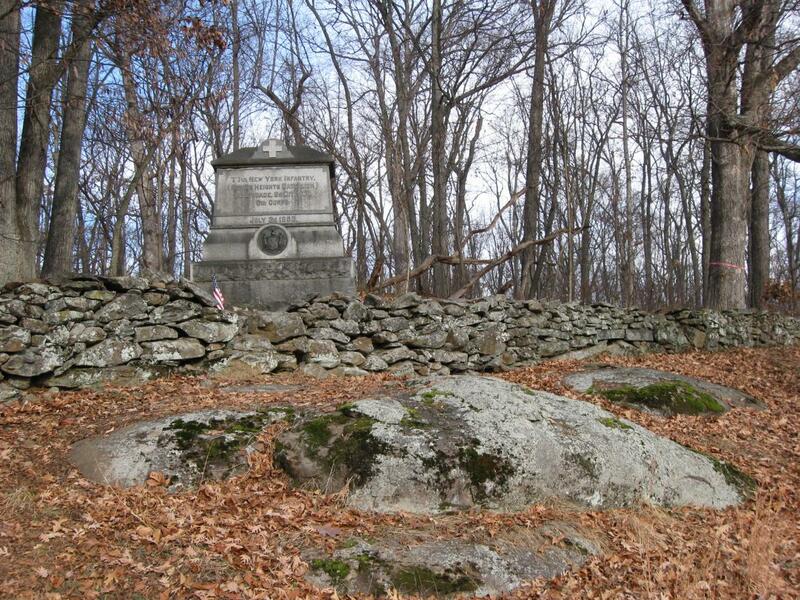 We are now on the summit where the monument to Rigby’s Battery A First Maryland Light Artillery was located. There were not trees here that blocked the view of the battery from Lower Culp’s Hill, which is approximately 800 yards to the front left of the monument. This view was taken facing northeast at approximately 10:30 AM on Sunday, December 19, 2010. The removal of all these trees will dramatically change the appearance of Powers Hill and probably lead to increased visitation to this area. This view was taken facing northeast at approximately 10:30 AM on Sunday, December 19, 2010. The removal of the trees that should be removed will give visitors a much better idea of why it was important to have Union artillery here firing towards Confederate Infantry on Lower Culp’s Hill the morning of July 3, 1863. 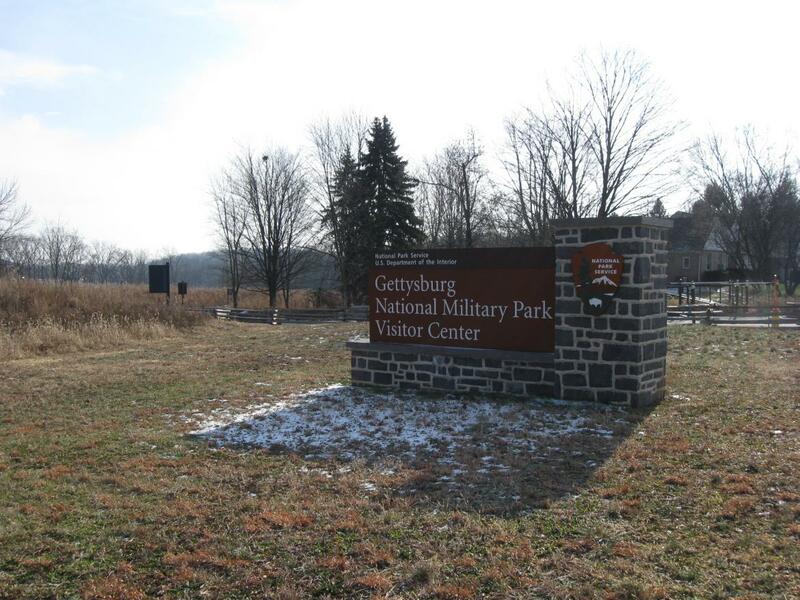 Visitors might stay a little longer in Gettysburg once they have another location that they will be told is significant, and can be shown (especially during the summer) why it is significant. 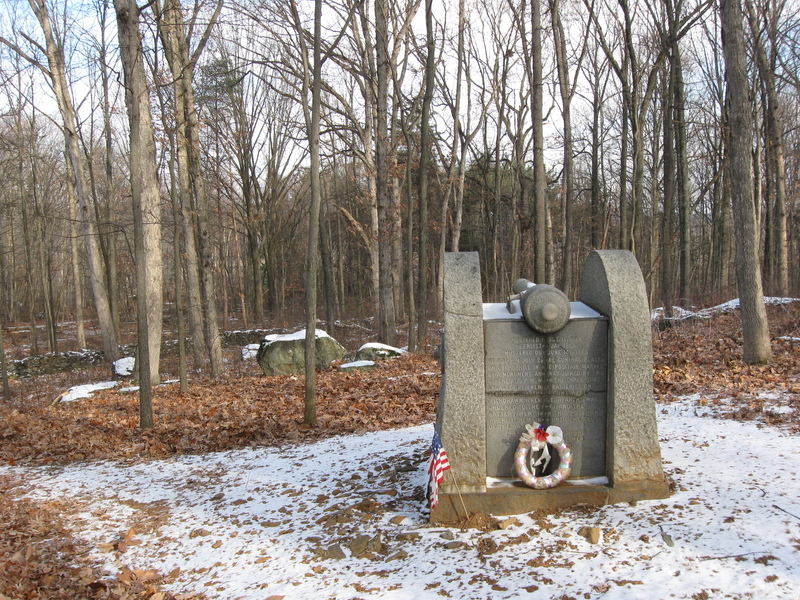 The granite monument in the foreground is to Battery E, Knap’s Pennsylvania Light Artillery. The monument in the left background is to Battery M, First New York Artillery. This view was taken facing northeast at approximately 10:30 AM on Sunday, December 19, 2010. Again, not too many trees will be saved here. The two trees in the background with the ribbons around them are in an area which we believe shouldn’t have any trees removed. This view was taken facing northwest at approximately 10:30 AM on Sunday, December 19, 2010. Again, we hope the stone walls in this area, such as the one at the bottom of the hill will be spared from the falling trees. This view was taken facing northeast at approximately 10:30 AM on Sunday, December 19, 2010. Let’s take a step back so that we can “see the forest through the trees.” The Granite School House Road is in the foreground. This view was taken facing north at approximately 2:00 PM on Saturday, December 04, 2010. We are now standing on Blacksmith Shop Road. Our interpretation of the Forbes drawing is that if one drew a vertical line through the middle of this image, the trees on the right would be cut down. The trees on the left would be saved. This view was taken facing northwest at approximately 2:00 PM on Saturday, December 04, 2010. 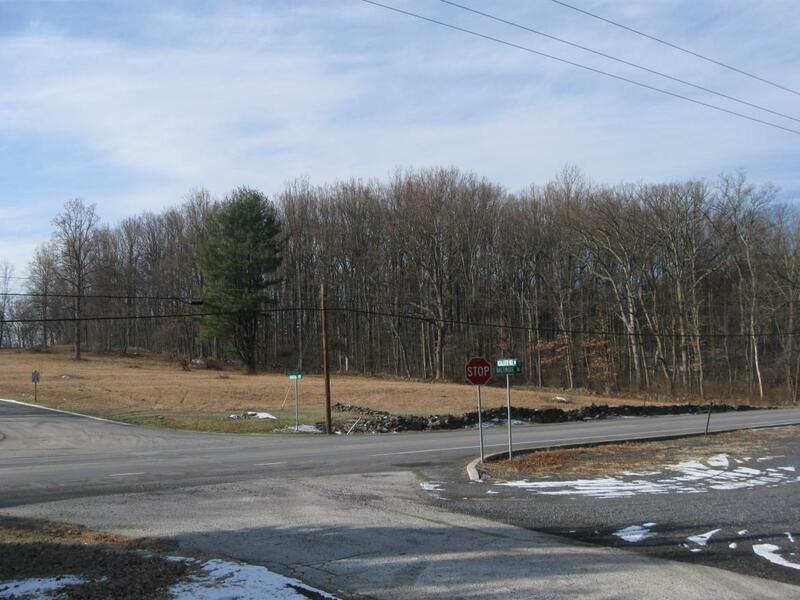 We are standing at the intersection of the Baltimore Pike, running from left to right (north to south) and the Blacksmith Shop Road/McAllister’s Mill Road. Almost all of the trees that you see will be removed. This view was taken facing west at approximately 10:30 AM on Sunday, December 19, 2010. Powers Hill dominates the background. We have now returned to the Welcome Traveler structure located along the Baltimore Pike. The Nathaniel Lightner House is the stone building in the right background. The building in the left background, near the Baltimore Pike, is a post-Civil War structure. Culp’s Hill is behind us. Union artillery on Powers Hill fired over the head of the camerman towards Culp’s Hill. This view was taken facing southwest at approximately 10:30 AM on Sunday, December 19, 2010. Another view of Powers Hill from the Visitor Center entrance on the Taneytown Road. Powers Hill is in the left background, just to the left of the sign. This view was taken facing southeast at approximately 10:30 AM on Sunday, December 19, 2010.